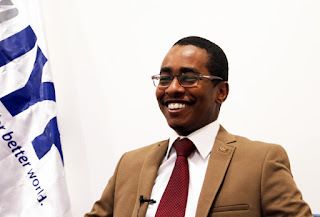 Ambassador Saeed ZAKI (born December 14, 1990) is the first Youth Ambassador for the Republic of Sudan. Appointed as Ambassador and Youth Representative at the national level for Sudan after been selected as one of 20 selected young reporters worldwide by the International Olympic Committee, as a part of the Olympic Games. Through his role as Youth Ambassador of the Republic of Sudan, Ambassador Saeed calls for youth empowerment through many community activities he launched such as SKILLS National Initiative, a youth movement at national level in Sudan, as well as being part of high-level panelist on youth issues. He also believed in empowering nations through UN global goals which approved at the United Nations Sustainable Development Summit on 25 September 2015. He also had a strong passion through uniting youth efforts worldwide through the International Youth Federation with a special focusing on raising the awareness around youth issues; unemployment, equality, training and capacity building as stated by Ban Ki-Moon and Ahmad Alhendawi UN Secretary-General's Envoy on Youth. Saeed completed his elementary education in Madina at Saudi Arabia. He holding an advanced degree in communication studies from Sudan University of Science and Technology. Young Reporter, International Olympic Committee (IOC). Media Adviser, The United Nations. Senior Adviser, Media & Press operations - Sudan University. Chairman, Advisory Board - CCOM Media. Vice Manager, Media Center, Sudan University of Science & Technology. President, Association of Multimedia in Sudan. Founder & President, SKILLS National Group. Head of Press Operations, ANOCA Zone V 36th General Assembly. Chief of Staff, International Conference of Camel Production, Khartoum - Sudan, 2015. Chief Protocol, The 1st International Conference on Distance Learning, Sudan 2013. Head, Standing Committee of Multimedia Department, Sudan University. Director, Executive Office of the President, SKILLS National Group. Media Associate/Regional Content Manger, Eskimi Inc. Member, Young African Leaders Initiative, Department of State, USA (2015). Member, One Young World, United Kingdom (2015). Member, World Youth Alliance (2014). Member, International Association of Engineers (2015). Member, International Internet Marketing Association (2015). Young Reporter, Media Operations - The International Olympic Committee (2014). Member, International Internet Society “ISOC” (2013). Associate Member, Sudanese Forum for Business Development (2014). Associate Member, Sudanese Olympic Committee (2014). Partner Direct, registered, DELL - United States (2011). Information Center Project, Press Division, Sudan Presidency Office, Sudan University of Science and Technology, Khartoum – Sudan (2010). Political Communication, Adella Center (CPR), Khartoum – Sudan (2011). Nile River Case, Ministry of the Cabinet, Khartoum – Sudan (2011). Sustainable Development Projects in Sudan, Sudatel Group, Khartoum – Sudan (2011). Member of Board of Trustees (2015- ), Member of the Executive Board (2016- ), IYF Secretary General (2016- ).